Q.: In this kind of situation, what are the chances of an upset/surprise result? The Léger poll, conducted last Wednesday to Friday for QMI news agency, showed that little has changed in the past week, with the Parti Québécois ahead at 33 per cent, followed by the CAQ at 28, the Liberals at 27 and Québec Solidaire at 7, with 9 per cent undecided. CROP’s last poll, released on Friday, pegged the number of those who say they could switch at 22 per cent. CROP puts the PQ at 32 per cent, the CAQ at 28, the Liberals at 26 and QS at 9 per cent, with 12 per cent undecided. But when the numbers are broken down regionally, the picture in both polls changes, especially in the predominantly francophone ridings in the northern and southern areas of Montreal, the so-called 450 area code region. For CAQ Leader François Legault, his party’s biggest challenge will be to make a significant breakthrough in the 450. Out of the 41 ridings in the entire region, which includes the south shore of Montreal and the northern beltway outside Laval, 15 of the 21 close races are between the CAQ and the PQ. The others are between the Liberals and the PQ. Here's the latest from Forum Research. Curious about Forum's track record in Quebec as it has been my observation that Leger and CROP are the 2 polling firms that have their eye on the Quebec pulse. Québec solidaire a bon espoir de faire élire ses députés dans Mercier, Gouin, Sainte-Marie-Saint-Jacques et Laurier-Dorion, voire dans Taschereau et Hochelaga-Maisonneuve. i'm really nervous and excited, obviously, i hope it's a pq minority with a qs balance of power. i've been looking really carefully at the polls and i think finally, it's brain = pq majority, gut = legault premier (not sure which), and qs at the two obvious seats. everything said and done, and numbers aside, it just doesn't seem like marois will be elected premier. It looks suspiciously as if the intent of publishing that poll at this precise moment is to assist the PQ in making the argument that the QS vote is collapsing dramatically and therefore, that left-sovereigntists should hold their nose and work for a PQ majority. Nothing that happened over the last two or three days should have caused THAT big of a swing from QS to the PQ. The poll should be treated as an outlier, at best...particularly since it appeared in the National Ghost. The results should known tonight by 10 pm or so - right? There is something happening: the real vote is happening today. Pauline Marois is not very popular, and so a lot of PQ supporters are voting backwards for her, either for her team or for the ultimate goal of the PQ. These voters will often say they support a minor party that is closer to their priorities, either QS or ON, but will in the end vote for the PQ. I doubt QS will have over 6% of the vote, if even that. It would still be twice what they had last time. Add half an hour and every talking-head will have some forecast, plus exit polls etc etc. gawd, last stab before the vote: way way off. ..
A poll from March 7th to March 10th by Leger Marketing shows the PQ at 31% (-2% since February) while the Liberals are at 30% (-1%) among decided voters in a poll 1,216 voters, a statistical tie. CAQ remained constant at 20% while Quebec Solidaire gained 1% to 9%, the Greens gained 2% to 5%, and PON gained 1% to 4%. In other words, all changes were within the margin of error during the last month. Because of the PQ's strong lead among Francophone voters, however, these results would, according to 308.com, bring it within 3 seats of a majority. In an Angus Reid poll of 7,091 voters on the popularity of premiers, Quebec Premier Pauline Marois fell from a 41% to 33% approval rating over the last 3 months while "Coalition Avenir Québec leader François Legault (46%) held higher numbers than Liberal Party of Quebec interim leader Jean-Marc Fournier (35%) and Québec solidaire spokesperson Amir Khadir (28%)". 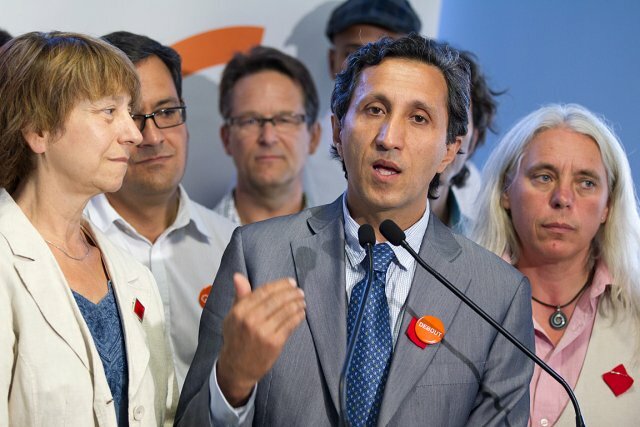 Khadir continues to show strong popularity, outpolling his party. You must have really liked that poll since you have posted in multiple threads and bumped them afterwards. it is getting to the point where it is spam. If you have a complaint bring it to the moderator's attention but last I heard u are not the moderator here. Good advice NR. Why don't you follow it. Good news for QS here. That is good news, though of course it is based in large part on the PQ reneging on the promises it copied outright from the QS platform. However the very bad news is the stong lead for the Quebec Liberal Party (and their Plan Nord).